Striking new home designs often run the danger of dominating their surroundings. The ground is often levelled and greenery is removed to create access to the building site. But when you have a great plot with an established garden, the real challenge is to adapt the design to the land. Today we will explore a unique hilly home where this has been done well. 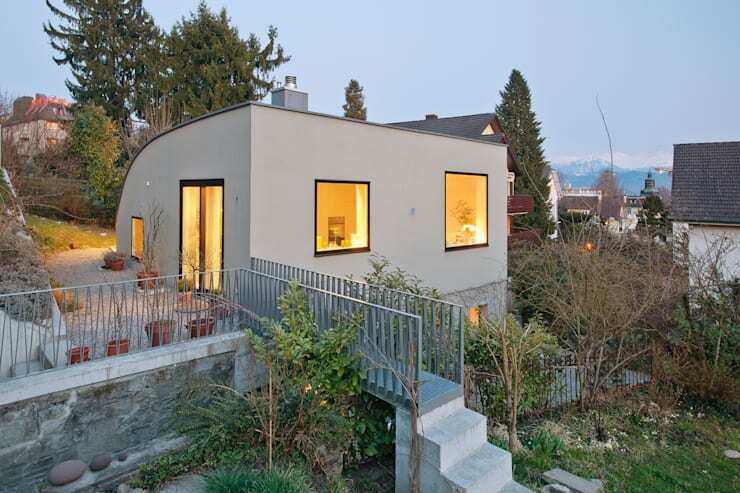 The home lies in the Swiss city of Lucerne and enjoys views of the surrounding mountains and rivers. Although the gardens are relatively large, the building has been kept modest and the design has been built around the natural incline of the land. 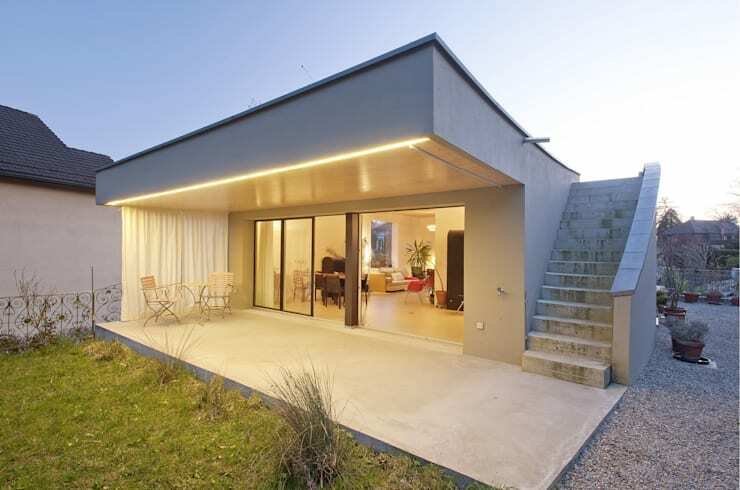 The architects compare this north-facing roof to the gentle slope of a grassy hill. The slope falls to one side, and really embodies the transition nature of the design that moves from public urban space on the right to the hidden garden paths on the left. 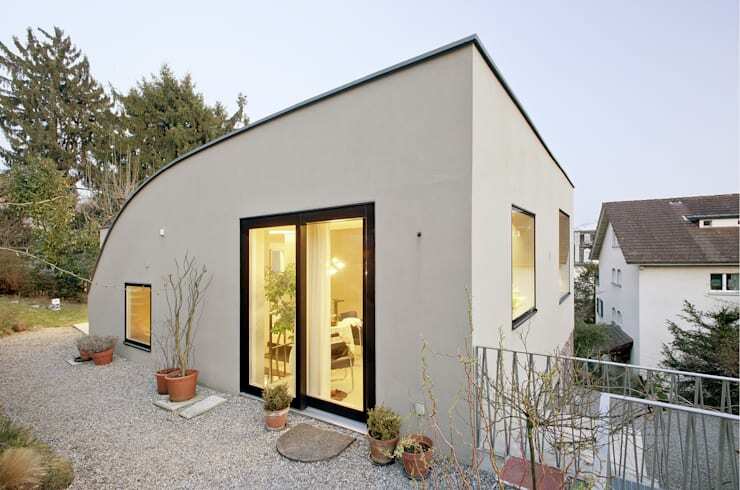 It is a minimalist exterior with a soft and deceivingly small appearance. Here we have a better sense of the dense urban surroundings, mountain views and natural greenery on the property. Although there is a lot of space, the architects have chosen to confine the building to the one mass and build down and follow the natural incline of the property. This allows them to retain the original feel of the property and take advantage of the natural views. To orientate ourselves, note the large window on the upper right. We will explore this in more detail next. We are still facing the same north orientation but we have moved further down the steeply sloping block and see the same large window noted earlier. The building now seems much larger than before. It also has the kind of natural cosiness that comes from the canopy of an established garden. We will explore the outdoor terrace on the far right next. The generously proportioned garden terrace is composed of minimalist masses of raw concrete. Large sliding glass doors lead to the living areas and offer a welcoming, outdoor feel to the space. The outdoor staircase on our right leads to another outdoor entertaining area with views of the mountains on our left. On entering the sliding glass doors we saw earlier, we come to the bright and airy living room. The open plan space has large windows that receive great evening sunlight. The design is minimalist, but the designers have avoided the large, open and almost cavernous shape that is popular in minimalist living rooms. 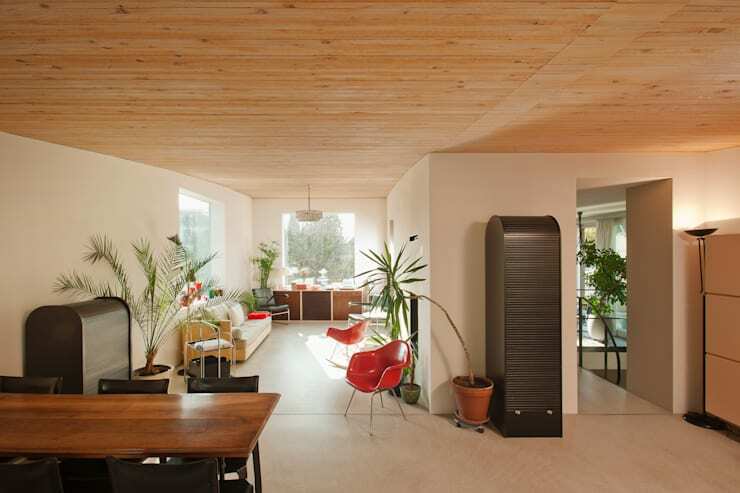 The timber ceiling is relatively low and the L-shaped living room is filled with potted houseplants and appears naturally cosy. With the living room on our left, we come to this lovely corner home office. The office has the same large windows, houseplants and generous views that made the other living room so welcoming. But this time the space has a large, black in-built cupboard and desk. Built in cabinetry like this is a good use of space in a small space like this. After moving down the staircase, we come to the contemporary black kitchen. 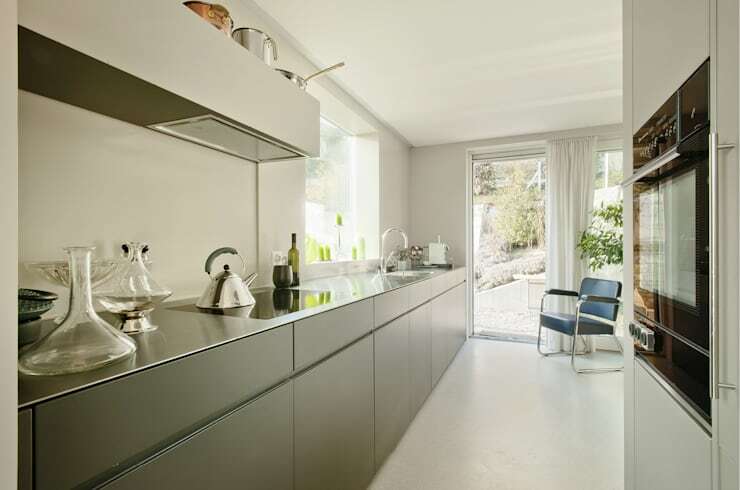 The galley style kitchen has handleless cupboard doors and a sleek, modern look. 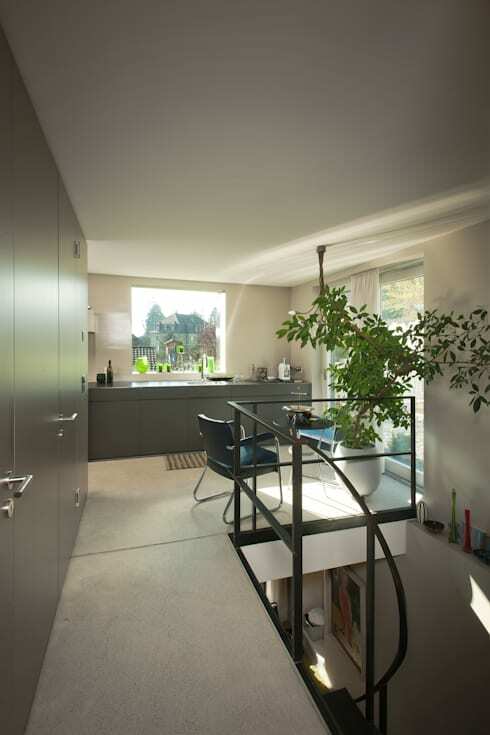 As with the study, the kitchen has been designed to make the most of a relatively small space. But the payoff is the cosy, natural feel of this home. Just look at the lovely, close views of the garden outside. 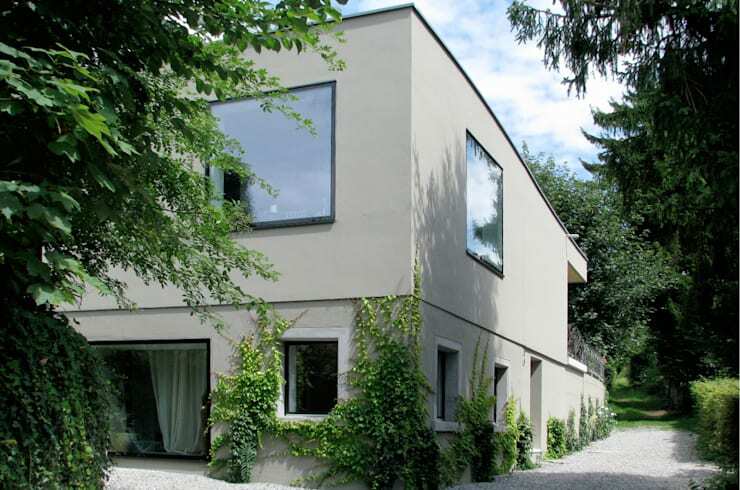 If you are interested in unusual homes, you'll love An angular home with hidden charm. What do you think of the unique qualities of this garden home? We love to hear from our readers, so don't hesitate to use the comments field below!